Architecture of OS X has a Hybrid kernel historically combining updated Mach kernel with subsystems from BSD and has a distinct client and server editions. Kernel is very important point to understand any operating system’s stability and definitely it is relevant for understanding the Architecture of OS X. 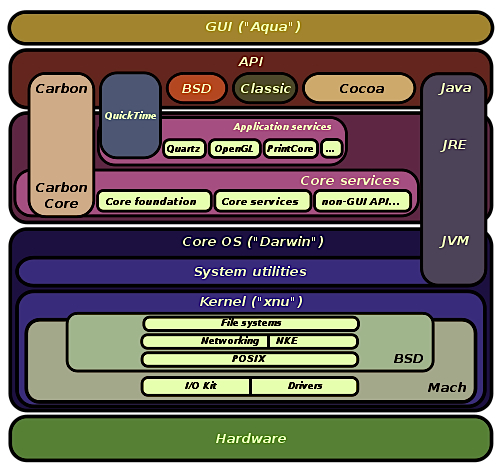 You can read our previous article on Kernel of Operating System and understand the diagram included in that article. It is a basic point to know that, OS X is the official nomenclature of Apple Inc.’s Mac OS line of operating systems. Under the previous name Mac OS X, the operating system was officially designated as simply version 10 of the Mac OS, that X represented roman numeral. The version 9 had a completely different codebase and will not be discussed in this article on Architecture of OS X. A slowness while shutting down, primarily due to installation of older Applications; which does not respond very quickly to be closed. We gave some solution to fix the slowness or sluggishness to shut down of OS X. Non Mac users must know, the ‘fast shut down’ is actually an experience like higher operating system – it simply closes all the running daemons and the screen and all hardwares immediately turns off. This is obviously present in OS 10.8.2 as well, but it is important to understand that, the Architecture of OS X has been crafted at kernel level freshly to support all modern hardware and Apple patented hardware like their newer display. Changes in Command Line, which can be fixed again back as the Command Line Tool iTerm2 acts on the UNIX core. The above diagram briefs up the architecture of OS X, which is technically not comparable with pure UNIX, neither can be labeled as Unix like. The needed source codes, except few parts are basically open but coded for Apple based system at kernel level. This Article Has Been Shared 9739 Times! Cite this article as: Abhishek Ghosh, "Architecture of OS X," in The Customize Windows, February 20, 2013, April 21, 2019, https://thecustomizewindows.com/2013/02/architecture-of-os-x/.